After meeting with ministers and members of trucker unions this Sunday (27), Brazil’s coup president Michel Temer announced a series of measures aiming to end a nationwide strike that is being staged for one week and has impacted fuel and food supply across the country. Meanwhile, truck drivers were still protesting and blocking roads in 24 states this Monday (28). 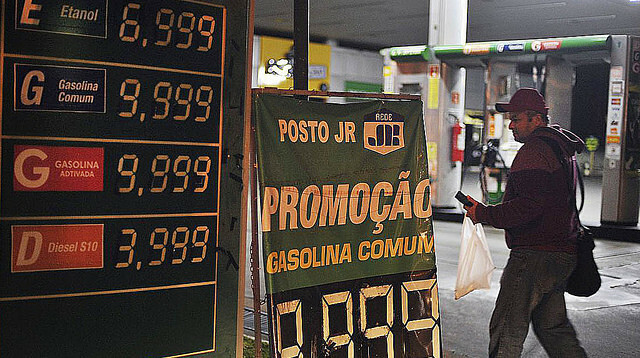 One of the measures announced by Temer is a R$0.46-per-liter disccount (approximately US$0.12) in diesel prices for 60 days, by eliminating two VAT-like taxes – the Program of Social Integration (Programa de Integração Social – PIS) and the Contribution for the Financing of Social Security (Contribuição para o Financiamento da Seguridade Social – COFINS), as well as the Contribution on Intervention in the Economic Domain (Contribuição de Intervenção no Domínio Econômico – CIDE). The latter was part of a previous deal the government offered to truck drivers last Thursday (24), but which was considered insufficient by different union representatives. After 60 days – 30 days more than what was previously offered –, diesel prices should be updated monthly. In addition to lowering diesel prices, Temer announced three more measures. One is that truck drivers will no longer have to pay toll for lift axles in raised position on state and municipal highways. Also, Brazil’s National Supply Company (Companhia Nacional de Abastecimento – CONAB) will hire self-employed truckers to transport 30% of its freight. The third measure is a minimum freight rate table for road transport. After the measures were announced, Brazil’s secretary of government, Carlos Marun, said the diesel price cut will cost the government R$10 billion (US$2.7 billion). While the measures announced by Temer satisfy truck drivers’ demands, parliament members and the country’s major left-wing fronts – the People’s Brazil Front (Frente Brasil Popular) and the People Without Fear Front (Frente Povo Sem Medo) – argue that these measures do not impact the underlying cause of the problem, which is the government’s fuel pricing policy. While Temer was addressing the nation, panelaço protests, in which demonstrators bang pots and pans from their homes, were heard in many capital cities, including Salvador, Recife, São Paulo, Brasília, and Rio de Janeiro.